Over/Under: Over 161.5 at 1.90 Bet Now! The start of the double-header in this week’s Euroleague signifies four games to go, and this means we are heading to the wire when it comes to the playoff spots. The hosts are already out of the running but the Spaniards come knowing that they are within touching distance of booking their place in the next round of the tournament. There is a range of factors that have to align to see Baskonia progress this week but a win of their own is vital, and this should be the starting point for the team to focus on. if the rest of the results fall into place, the celebrations can begin, but if not, at least a win keeps them moving in the right direction. 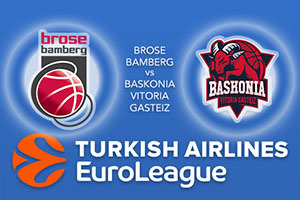 Brose Bamberg will do all they can to slow down Baskonia’s progress and the Germans will be keen to gain a modicum of revenge for a loss earlier on in the season. In fact, Baskonia have won six of the seven games between these teams, so there is a lot that the Germans will be looking to avenge. Baskonia grabbed an 81-74 result in the earlier meeting this season when Rodrigue Beaubois and Johannes Voigtmann both grabbed 20 points in a thrilling night in front of the Gasteiz fans. The key player for the home team in this game will be Darius Miller, who has offered an average of 12.8 points per game and Nicolo Melli, who has offered an average of 11.7 points per game while also providing a return of 7.6 rebounds per game, which is also the best return in the league. Janis Strelnieks is injured and his absence will be a blow for the Germans. Shane Larkin has so often been the key player for Baskonia this season and he has a record of 13 points per game. Beaubois has chipped in with an average of 12.2 points per game while Toko Shengelia has offered an average of 11.2 points per game. This could be a tight game but take Baskonia Vitoria Gasteiz at -2.5, which is provided at odds of 1.90. If you are looking for the Over/Under market, go OVER 161.5 at odds of 1.90. Bet Now!